A challenging ride, with steep climbs and turns, the trail winds through the hardwood forest near Quadna Mountain. Stop along the Willow River for a must-see view from the bridge. Parking and picnic areas are located off the trail. 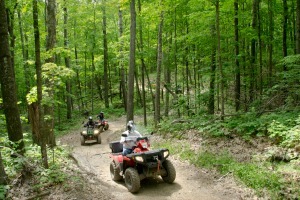 Trails are provided by Aitkin County and local ATV Clubs. Parking is available in Hill City and Swatara.